BUY 2 SUPs & SAVE $50 | APPLIED IN CART! There are more than enough ways to enjoy stand up paddle boarding, but there are a few things you should NOT DO if you want extend that enjoyment. You may not know it yet, but you and your board have a ‘mutual understanding.’ You take care of it and it’ll take care of you! At times this relationship may seem one-sided, but remember who keeps you afloat in rough seas.😉 By properly looking after your SUP you can help extend that loving relationship into something longterm. Because, although standup paddle boards are a sturdy piece of equipment they still require a bit of love and consideration. So if you want this to be one you remember, avoid the following. 1. DON’T leave your board dirty. Like all valuable equipment a stand up paddle board requires a bit of TLC. Sure they’re not fragile enough to warrant a feather duster, but you still want to keep it clean. Especially if you’ve spent the day in salt water. Once you’re done for the day rinse your board off with freshwater and then dry it thoroughly with a towel. This isn’t just to keep it looking pretty, but to help clean off anything that may damage or stain the board if left on (usually the small stuff, unnoticeable to the human eye). 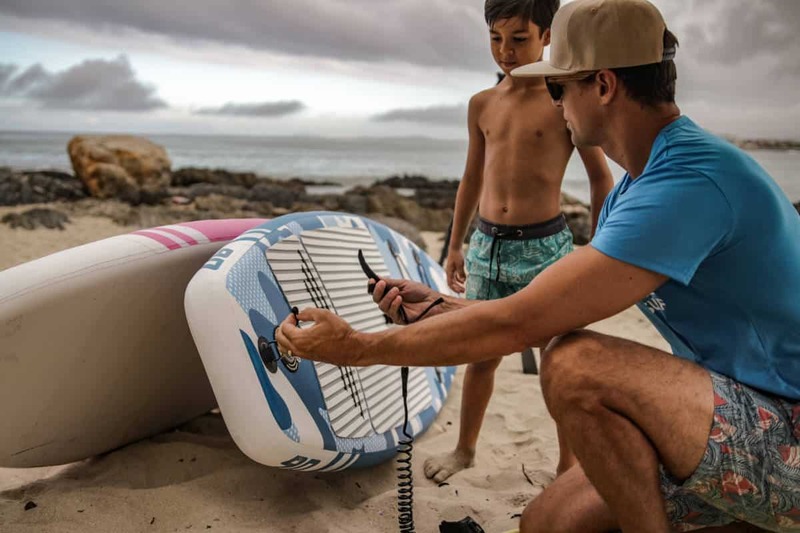 Follow these tips and keep boards looking crisp and clean like this 2019 Thurso Surf Expedition. 2. DON’T leave your board exposed to sun. This may seem strange since you’re often taking your board out when it’s the most sunny, but it’s crucial. It’s one thing when you’re using your board and another story if you’re storing your board outdoors for extended periods. Leaving your board outdoors all of the time exposes it to unnecessary UV, heat, and weather damage. You may have experienced something similar with clothing, outdoor furniture, even a ball or two left out in the yard. The sun’s rays fade objects left out for too long and will do the same to your board. Extreme heat and fluctuating temperatures can also take their toll, so if you’re not using it it’s best to keep it protected from the sun. A properly stored board makes setup quick and easy, letting you spend more time on the water. 3. DON’T store your board incorrectly. It’s worth taking the time to find somewhere you can safely store your board after a day’s paddle. You’ve taking all the time and effort to take good care of it in the first place it would be a mistake to let if get damaged when you’re not even using it. Try to find somewhere where it won’t be affected by weather and temperature changes. Although it may be tempting to shove it under something outside (like your deck), or constantly keeping it in the trunk of your car (which becomes an oven on hot summer days), simply keeping it out of direct sunlight isn’t ideal. Luckily iSUPs are much easier to store indoors in a garage or basement that’s less exposed to dramatic temperature changes. 4. DON’T drag your board. This may seem obvious, but you’ll see countless people doing it regularly. It’s understandable that because of the size of stand up paddle boards people want to take shortcuts to make their transport easy. However, cutting corners can lead to damage. 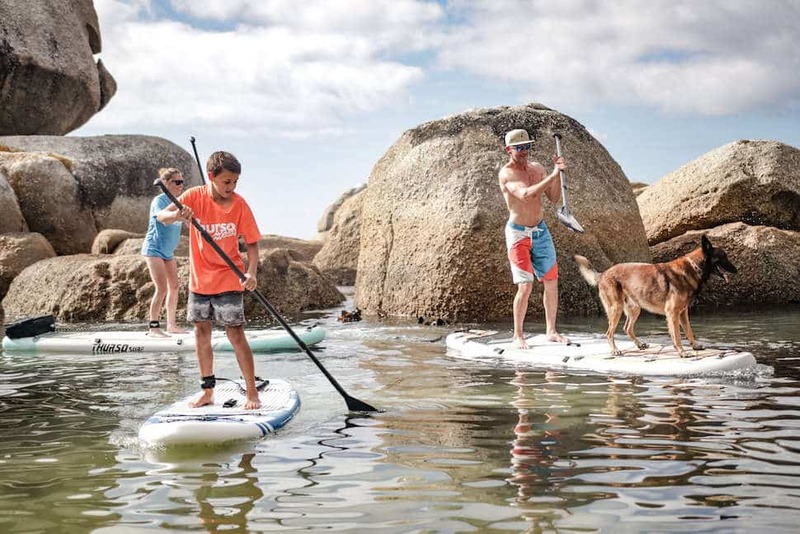 Dragging your board in and out of the water regardless of the terrain risks leaving your ‘significant other’ (your SUP) scratched and scuffed. It’s easy to think “it’s smooth sand” or “some soft grass”, but you can never be sure about what debris your eye may have missed. If you end up dragging your board across something detrimental you’ll end up regretting it. 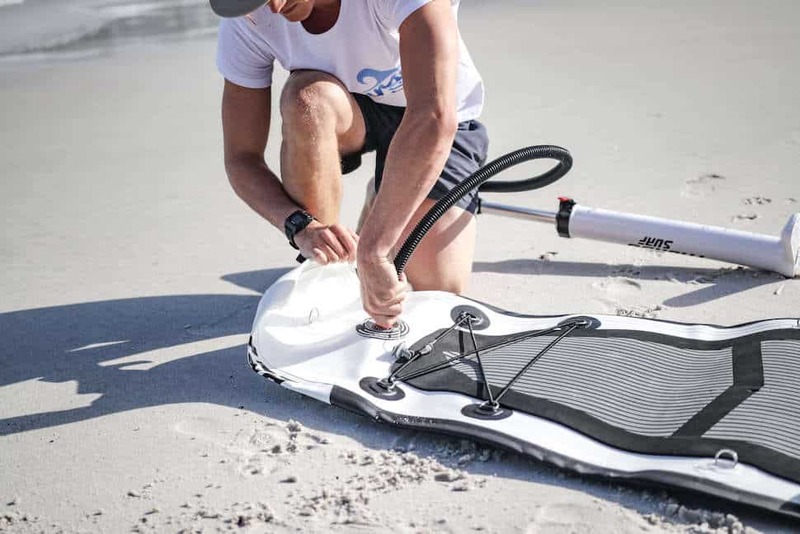 Opting for an inflatable stand up paddle board with a roller backpack, like those included with ThursoSurf’s 2019 lineup, can get you to the water scrape free and easily providing a layer of protection and convenience. Although they’re far more durable than typical hardboards, scrapes and scratches create additional friction which slows your board and reduces its glide. 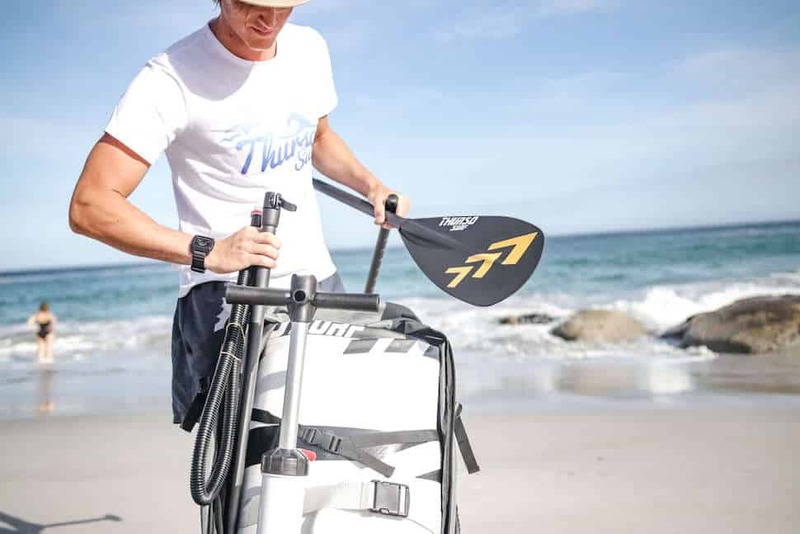 Thurso Surf’s iSUP Roller Backpack makes transporting your board easy while keeping it protected. 5. DON’T transport your board without a bag. 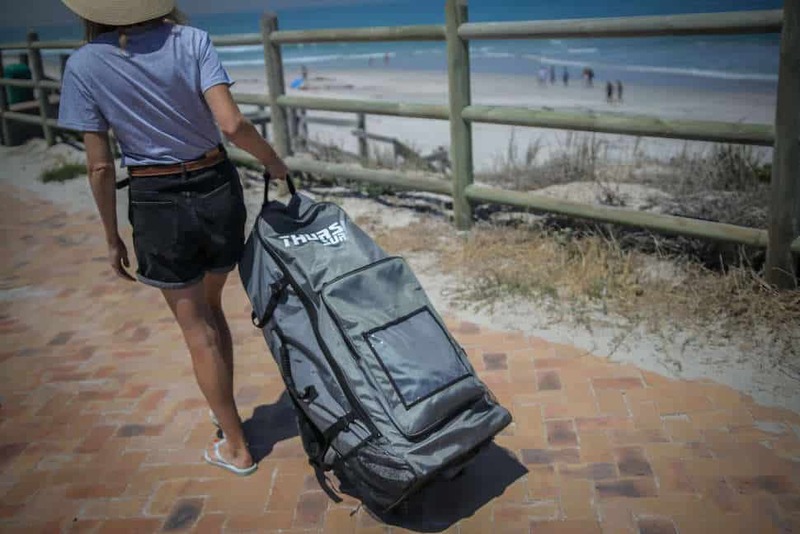 Similar to some of the issues associated with dragging your board, chucking your board in the trunk instead of transporting it in your board bag bag increases the risk of damage. Instead of the hidden debris you may have missed on the beach while in transport your board is now at risk from countless other hazards. A bag will help protect your board during transport from most of the unseen potential damages or accidental bumps and bruises that can occur when moving something. Even if you’re extremely gentle and cautious when handling your board when it’s out of your hands and in your car it’s no longer necessarily only up to you. 6. DON’T paddle in shallow waters. Regardless of where you’re paddling you should always be aware of the area you’re in. Obviously river, lakes, and oceans all come with their differences, but there’s one culprit you can find everywhere, shallow water. Paddling in extremely shallow water can lead to damage caused by your board scraping against what lies beneath. The damage from paddling in shallow water can range from mild to extreme, but is easily avoidable if you stay away from it altogether. Once you notice you’re getting into the shallows, hop off your board and wade into shore to keep your board and fins in great shape over the long haul. 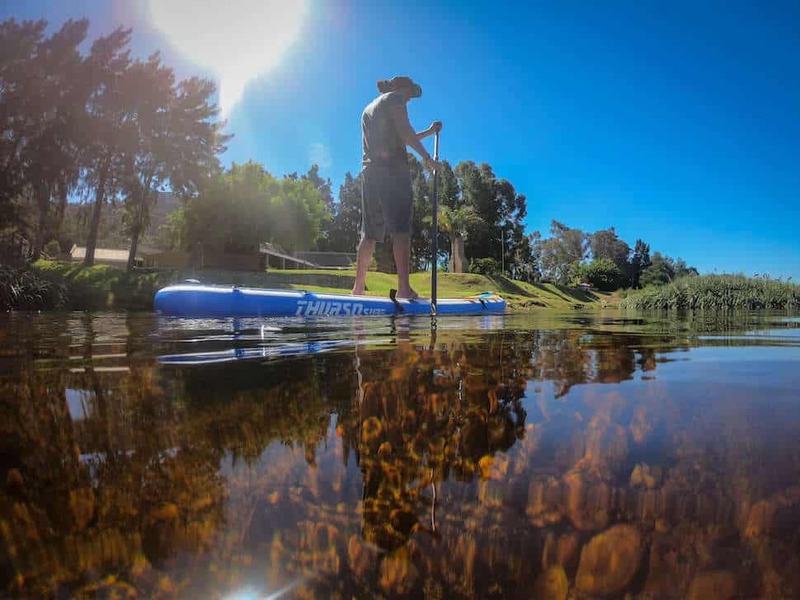 Standup paddle boarder cruising a river in South Africa. 7. DON’T forget your fins. They’re easy to forget about because they’re only a small part of the board, but their position on the underside of the board makes them a prime victim of damage, especially in shallow water. While fins are replaceable, damage to them will dramatically effect the performance of your board compared to minor damage elsewhere. That’s why all of the other DON’Ts in this article respect the fin. Your storage, transport, cleaning and where you choose to paddle will determine how often you have to replace your fins. If you want to be sure, it’s worth taking the time to remove them when transporting and storing. All of our boards come with a no-tools-required Quick Lock Fin Set so they snap on and off in just a few seconds. It’s also a good habit to make sure the water your getting on in is deep enough for the fins to clear the bottom. Although minimal, your added weight will of course drop the board ever so slightly, but depending on what’s beneath and how close it is, that could be enough to do some damage. 8. DON’T assume proper care of your iSUP is common knowledge. With something as fun as paddle boarding it’s common to want to share the pleasure. Loaning a board to friends or family is a must. Usually one or two trips is all it takes to have them out there with you on a board of their own. As a more experienced paddle boarder you can impart some wisdom by sharing what you know. This can help you protect your board when it’s borrowed and save them from making simple mistakes. If you’re not feeling up to teaching them the ropes simply share this article. Final Thoughts and One DO for Those 8 DON’Ts. A family following the ‘one DO’ of this article. © 2019 THURSO SURF. All Rights Reserved.